Exclusive: Arnold’s Health & Wellness Platform & Filming T6 for 3 More Weeks! While Arnold Schwarzenegger took a short break from filming 2019’s Terminator to attend and promote the Arnold Sports Festival in Madrid, he told TheArnoldFans.com that he’ll be back with an all new line of health supplements. A Massive Arnold Schwarzenegger T-Shirt Sale! Is it wash day? Nothing clean? Or do you just need some new clothes and some special to wear? Welcome to one of the largest Arnold Schwarzenegger T-shirts collections for sale! About these shirts: Some have come to me over the years from film studios, Arnold’s staff of from officially licensed shops. Many of these very rare shirts can be yours and will go to the FIRST person who claims them for the set price listed below. Arnold Wishes Linda Hamilton Happy Birthday from Terminator Set! The good old days are back! Arnold and the original Sarah Connor, Linda Hamilton, have been busy filming the new Terminator movie together, and September 26 was Hamilton's birthday. So Arnold marked the occasion by posting a photo to Twitter that recreates one from the T2 set. Planning your Arnold events for next year? Good! We just got the official announcement for next year's Arnold Sports Festival: Mark your calendars for the 2019 Arnold Sports Festival, February 28-March 3, when we’ll celebrate our 31st anniversary with a record 80 sports and events! Terminate Gerrymandering & Hang with Arnold on the Set of Terminator 6! It’s already been over five weeks since Arnold started filming the next Terminator and he has several more weeks to go. The amazing news is you could win the chance to hang out with Arnold Schwarzenegger on the set of the new Terminator movie! San Diego Comic Con: 2018 Review and What’s to Come In 2019! 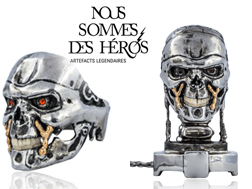 TheArnoldFans were BACK at San Diego Comic Con this year and once again, there was plenty of new prototype collectibles to make all of us Terminator and Schwarzenegger fans happy. This is the biggest pop culture convention in the world and it’s always fantastic to meet up with our fellow fans..
Arnold is BACK Filming "Terminator” as the T-800!! Three years ago, "Terminator Genisys" was released in theaters and while it pleased a tad more than half the fans, it didn’t perform as well as we had all hoped. Considering it was not a mega box office hit, many fans believed it might be the final nail in the coffin and the franchise would be terminated forever. However, with great delight, we can announce that today - Arnold is at last BACK! Happy 71st Birthday to Arnold! The Brutal Facts: 2019’s “Terminator” Must Be Rated R! 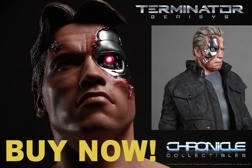 Win a Mini Arnold Statue from His Official Museum! Arnold's birthday is coming up in less than 2 weeks and as usual TheArnoldFans will celebrate the big day with the fans around the world. Coincidentally. TheArnoldFans have just reached 25,000 followers on our Instagram @thearnoldfans, and we wanted to do a special giveaway to thank you for your support and help us reach the next milestone at 100,000.